Bernard-Paul Heroux: Fact or Fiction? The philosopher’s words of wisdom about tea are quoted in articles by the Telegraph, Reuters, the Guardian and numerous blogs and websites online. An image search also shows that the Tregothnan estate in Cornwall and American retailer Trader Joe’s use the quote on their packets of tea. The former journalist in me wanted to find out more about the mystery man behind the famous phrase. Searches of the name Bernard-Paul Heroux return no wikipedia listings and his name isn’t listed alongside other famous Basques or famous Basques philosophers. In fact, the only hit I got at all, aside from the quote, was that the Heroux name was a surname from the Languedoc-Rousillion region of France, a good six hour drive from Basques country. However, the Heroux surname is not listed in any online database of Basques surnames and trawling several sites of Basques births, deaths and marriages returned nothing. It’s as if Mr Heroux appeared at some point in the 1900s, made his famous quote about tea and then vanished into thin air. Apart from the lack of evidence he ever existed, my other major doubt around the authenticity of this phrase is the fact that Basques country, as with other parts of northern Spain, has had has much more of a coffee-drinking culture for centuries. It’s just a fact, the Basques and the Spanish are traditionally coffee drinkers – not tea drinkers. So is Bernard-Paul Heroux’s quote fact or fiction? Was he a real man or it just a figment of the imagination, dreamed up as part of an elaborate piece of marketing? I don’t want to make a storm in a teacup but until someone can prove to me otherwise, I think it’s probably the latter. Etymology and the origin of English language have always fascinated me, partly because so many of the words we use every day represent remnants of history; artefacts left behind by the Roman Empire, the Vikings and the Norman conquest. Although words relating to computing and technology are much younger, some are just as quirky and steeped in history as those from the past. The origin of the word ‘bug’ in the computing world is often mistakenly credited to computer scientist Grace Hopper. The story goes that while working on the Harvard Mark II computer in 1947 she discovered a dead moth stuck in a relay. It was removed and taped into a logbook where she wrote “First actual case of a bug being found” (see picture below), which suggests that the term was already in use at that time. While this might have been the first literal case of ‘debugging’, there is evidence that ‘bug’ had been used in engineering for many years before that. ‘Bugge’ (n) originally meant scarecrow then became an early name for bedbug. As language evolved, another off-shoot of ‘bugge’, the scarecrow, was ‘bogey’, an evil or mischievous spirit. This gave rise to a family of other ghost and hobgoblin names including ‘bogeyman’, ‘boggart’, ‘bogle’ and ‘bugaboo’. While the archaic form of ‘bugbear’ is also another hobgoblin figure. In general these all have the same negative connotation of things to avoid and that cause fear or irritation. The direct descendant of these words is ‘bogey’ which still survives today in modern English, in aviation where a ‘bogey’ is an enemy aircraft, in golf where a ‘bogey’ is one over par (a bad score) and a ‘bogey’ (UK) or ‘booger’ (US) is a piece of nasal mucus. By the middle of the seventeenth century, the word ‘bug’ no longer meant scarecrow and had come to mean ‘insect’, which makes sense as many people consider them to be alien and scary. The earliest references to ‘bugs’ meaning insects often related to ‘bedbugs’, supposedly because when someone woke up covered in bedbug bites, it was as if they had been visited by something scary during the night. So it seems fair to assume that the word ‘bug’ came from ‘bugge’, the Middle English for scarecrow, which led to ‘bogey’ and all the similar words meaning an obstacle, a source of dread or something to be feared. In modern times the word ‘bug’ has become a verb meaning to vex or irritate, while the noun form has become a synonym for disease-causing germs, crazily enthusiastic or obsessive people (e.g. a firebug is a pyromaniac), concealed recording devices used by spies and perhaps, thanks to Edison, an error in technology. Functions are used to perform defined tasks. These are declared by the function keyword. A function will only be executed when it is called/invoked. e.g. In this case the function is called “greeting” so the input below will return “Great to see you Dave”. Return is a statement used to stop the execution of a function. It will also return the value of a function. In the example above, x will be returned as ‘8’. Console.log commands are used to display data . Console.log() will take whatever is inside the parentheses and log it to the console. If/else statements are used to make decisions in the code. An if/else statement will execute one block of code if a specified condition is true, if the condition is false, another block of code can be executed. Loops are used to execute a block of code a number of times. Loops are useful if you want to run the same code repeatedly with different values. It’s all about getting the computer to do the legwork for you, as opposed to typing out numerous lines of code. Here is an example of a for loop. This will run 5 times, with values of ‘step’ 0 to 4.
for – this will loop through a block of code a number of times. while – this will loop through a block of code while a specified condition is true. for/in – this will loop through the properties of an object. do/while – this will also loop through a block of code while a specified condition is true. Arrays are special types of variable that can used to hold multiple values at one time. A bit-mapped screenshot from the Xerox Star workstation released in 1981. The icon didn’t really appear for nearly 30 years until it was adopted as a menu icon by social networking site Path, which launched in 2010, and then later Facebook and Apple iOS applications, meeting a growing need for more content to fit onto smaller smartphone screens via the use of menus. It has since become widely-accepted as a menu icon by UI designers and can found everywhere from web browsers Google Chrome and Mozilla Firefox, to news websites such as the BBC and others. A selection of designs by Apple Macintosh designer Susan Kare. Hamburger icon Norm Cox for Xerox Star. 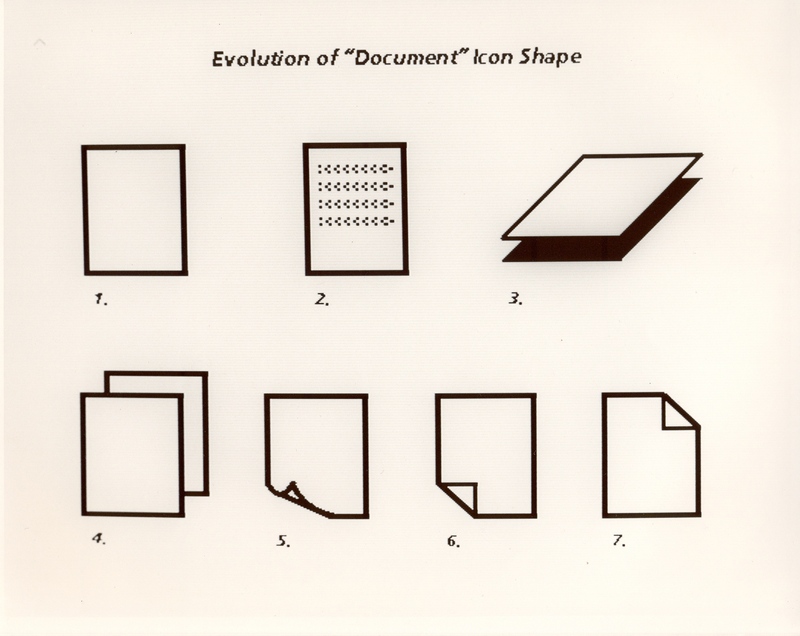 Document icon Norm Cox for Xerox Star. Command icon Susan Kare for Apple Macintosh. Fill icon Susan Kare for Apple Macintosh. Search icon Keith Ohlfs for NeXT Inc.
*The mouse cursor arrow originally pointed upwards but because resolution was so low it was easier to draw an arrow at a 45 degree angle. As software and apps become more user-friendly and commonly-used icons become universally understood, there is a growing tendency to scrap text. Digital designer Thomas Byttebier makes some excellent points about the importance of using text in his blog here, with the concluding statement being “when in doubt, the best icon is a text label.” He lists a number of extremely popular apps and sites where icons are pretty ambiguous. Take Instagram and Spotify for example. Are people aware of what this icon actually does? In both cases this in-tray icon is for accessing your inbox and sending direct messages but I think the messaging feature is clearly overlooked in both applications. When I asked friends who have been using the applications for several years whether they were aware of the messaging feature they just looked at me blankly. One said “Oh, that bikini thing”, the other thought it was a basket. So there’s clearly a lack of clarity over the purpose of the icon but whether that’s due to the ambiguous design or a lack of need, I’m not sure. It’s probably a bit of both. Twitter have also had some issues with ambiguous and non-universal icons, often presuming that users will just intuitively understand what the icons do and sometimes getting it wrong. As a result Twitter’s user growth has actually slowed as new users that are attracted to the site often have a hard time catching on to how it works. The arrow icon for ‘Reply’, the envelope icon for ‘Message’ and the ellipsis (three dots) ‘More Options’ icon are recognisable but the heart icon for ‘Like’ will only be familiar with people who have used Instagram and other social media. A new user is unlikely to know what the ‘Retweet’ icon does unless they are familiar with Twitter’s basic concepts. It is interesting to note that Twitter have added text labels to the bottom five icons (highlighted in green in the image above) because other than perhaps ‘Messages’ their function is not obvious to the user. While documentation is sometimes seen as an afterthought in the development process, in my opinion the text and written content is an inherent part of user experience for all software, no matter how intuitive the UI designer thinks his icons are or user-friendly the product is. If you want to avoid ambiguity, text will always be the best way to get the message across to the user.